Say hello to the coolest sneaker head on the block RN, @jessylaw. We managed to steal 5 minutes of her time at our #GirlsThatGo event to get the down-low on how to stay cool AF and look it too. I’m Jess and I’m from Surrey (but a Shoreditch resident now) with American, Danish and English heritage. I work as a social editor for a magazine and I’m a huge fan of fashion – with sportswear, streetwear and vintage being my favourites. I love travelling, horror films, cartoons (think Family Guy and Rick and Morty), blogging, modelling and acting on the side of my main work. If had to summarise my style, I would say that it’s a definite cross between streetwear, sportswear and vintage, with a 90’s feel. I have a definite obsession with all things 90s and love finding vintage items that stand the test of time, like some of my mums old Nike jumpers! But really, it’s all about the sneakers! I’m a believer that any outfit suits a great sneaker and am a big fan of vintage silhouettes, comfort is key! Style is quite fluid but when it represents your personality it’s always authentic. People! Travelling around the world (and London) you see so many cool people with diverse style and seeing how just normal every-day people throw together their outfits always gives me so much inspiration. Because I love 90’s style, I’d say Aaliyah, Janet Jackson and TLC are my absolute style icons. Baggy trousers and crop tops with a great pair of sneakers… I would wear that every day if I could! Tips for people searching for style inspiration? Here comes a cliché… but its sooo important to just be yourself. If you like it, rock it, simple as that. To get inspiration, I’d say just get out to some cool spots and events and see what people are wearing! Follow bloggers your style aligns with on Instagram and experiment! Why do you love Nike? They just get it so right with every aspect of style and comfort. 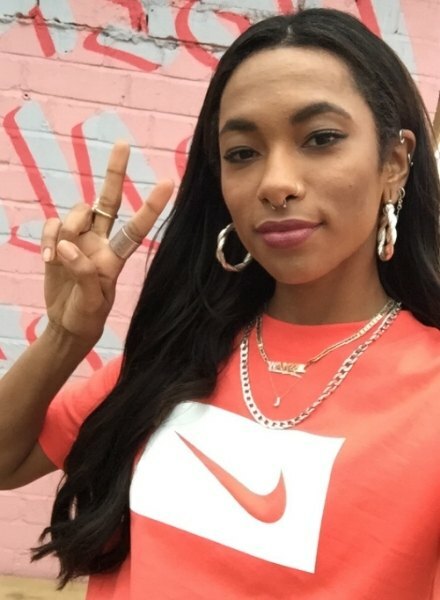 I have always been massively into sports so I naturally love brands like Nike, seeing their constant infiltration into everyday style. I love how they bring back old trainer silhouettes, (97s and 98s I ADORE) but my favourite product would definitely have to be a simple Air Force 1. I’ve had so many pairs over the course of my life! They go with everything, so comfortable and stand the test of time with changing fashion. A real MVP. What does #GirlsThatGo mean to you? The #GirlsThatGo message is so important right now for us women, we stand our ground, we feel great, we get it done – and we look great doing it! It’s embodied perfectly for me in the React shoe, its stylish, it is versatile and most importantly, so comfortable. It’s all about style confidence, empowerment, and comfort whilst you are working hard every day of your life. #GirlsThatGo are the ones who live their lives to the full, stay authentic, work hard, and make waves in their fields. Something we all strive to be like, am I right? Hell to the yes! We love you Jessy.